Zane Benefits, the leader in individual health insurance reimbursement for small businesses, announced today the publication of a new eBook, "The Small Business Guide to Open Enrollment." The guide helps small businesses understand how to use the Health Insurance Marketplaces to offer better health benefits, and why open enrollment is the opportune time to transition to employer-funded individual health insurance. According to Zane Benefits, most small businesses face a problem – they want to offer health benefits to recruit and retain key employees, but traditional group health insurance is no longer affordable. The solution is to allow employees to purchase their own individual health insurance plan, and reimburse employees for their premium, or a portion of their premium. According to Zane Benefits, this type of employer-funded individual health insurance is becoming the way for small businesses to offer health benefits. 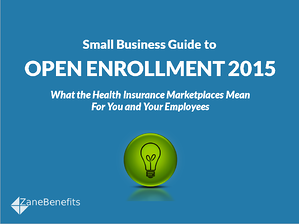 The new guide helps small business owners and HR professionals navigate the 2015 open enrollment period, providing tips and tools on using the Marketplaces to offer better employee health benefits.